Property Size 3,101 sq. ft.
Lakefront living at its finest! Enjoy incredible lake views from four of the seven bedrooms and from both the living room and family room. You will have your own long private beach, upstairs and downstairs living rooms and kitchens, three screened porches, three decks and two patios, PLUS a private hot tub that is open year-round! Holabird is located in the woods just one house away from the end of a private dirt road, so there is no through traffic. We do accept your friendly, non-aggressive, non-shedding dogs at this house as well. Holabird House is a modern house and has just been completely remodeled in early 2016. There is a new expanded upper level kitchen, new bathrooms, updated paint and decor, and a renewed lower level living area with a wet bar and pool table soon to come. The entrance to the house presents you with stairs to the right that lead up to the main upper level living area, kitchen and five bedrooms and a hallway to the left that leads to the downstairs second living area and two more bedrooms. 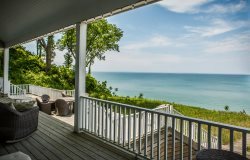 The upper level consists of a huge open living space with stunning high ceilings and tall lakefront windows that provide an amazing view of Lake Michigan. There is a sectional sofa, multiple chairs and a wood stove for use in the winter. This great room opens up to the dining area and kitchen, so everyone can spend their time together preparing meals and dining. This upper level has two residential wings with lake views, one to the north and one to the south. Each wing consists of two bedrooms and one bathroom. There is a fifth bedroom on the non-lakefront side of the house that has two twin beds with two trundle beds below that is perfect for kids. Three of the lakefront bedrooms have their own access to wonderful patio decks overlooking the lake at the northwest and southwest corners of the house. There is another deck at the northwest side of the house with a gas grill (we supply the propane). The lower level of the house has another open living area that is centered around a fireplace (available for winter use) and backed with a wet bar. There are two bedrooms and one full bath on this level as well as a laundry room tucked away to the north end of the house. There is a shaded screened in porch with a dining table just outside of the living area and this in turn leads to the well-lit beach stairs. Your private Lake Michigan beach awaits you below the house, 101 steps down with a landing and bench in the middle. There is also a hot tub located on the non-lake side of the house in an enclosed, fenced-in patio. The lower level bedrooms both open up to this patio, so you can sneak out for a late night dip! The Holabird House is in Harbert, Michigan which is a great central location for exploring Harbor Country. You are only five minutes from the restaurants and shops of downtown Sawyer and just about the same distance from all the action of downtown New Buffalo! Lakeside and Union Pier are the next towns south and they have their own cute attractions as well. There are also many fun shops and restaurants lining the Red Arrow Highway, which is the easiest path between our lakefront towns. Holabird House is now booking for full week-long summer stays and is also a terrific house in which to spend an off-season weekend. As mentioned, the hot tub is open all year long! Everyone was very helpful, the house was spotless, and we had a very fun weekend. Everything was awesome. The house was perfect and we would love to rent from you again! Living space and the view. What an outstanding vacation, enjoyed the views which were spectacular of the lake. Was especially nice to have three separate bedroom areas that all share a full-size bathroom. Plenty of space for people to spread out. Jon was easy to work with and very helpful with any questions I had. Each one of us 11 ladies loved the property. It was perfect for our relaxing girls getaway. Very accommodating and friendly team. Both Toni and Jon went above and beyond to make sure we were comfortable and have everything we needed at the Holabird house. Fantastic house, beautiful view, didn't want to leave!